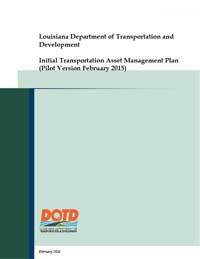 The Louisiana DOTD – TAMP [DRAFT] is available here. As part of a national pilot project, Louisiana DOTD was one of three DOTs selected to work closely with the Federal Highway Administration to create a Pilot TAMP to serve as a guide for other states to develop their plans. LADOTD’s initial TAMP focuses on pavement and bridge assets and plans to address additional assets in subsequent versions of the TAMP. This document includes the following sections: Current Methods and Tools, Data Management, Financial Plan, Introduction, Inventory and Condition, Investment Strategies, Lifecycle Management, Objectives and Measures, Performance Assessment, Process Improvements, Regulatory and Legislative Requirements, Risk Management.